Visit us at RFID Journal LIVE Booth #738 in Orlando, FL, April 8-10, 2014! 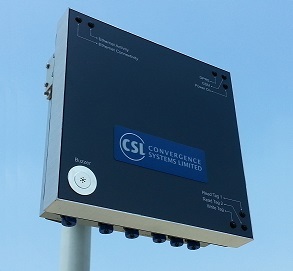 Convergence Systems Limited’s new CS208-3G RFID fixed reader is a truly intelligent integrated reader with an embedded edge server and diverse connectivity options including 3G Wireless. The CS208-3G continues CSL’s tradition of reliable RFID technology, adding 3G connectivity with high powered antenna to the CS208 platform to create the first truly intelligent integrated reader with an embedded edge server. Offering all-weather and MIL-STD-810 durability, this ruggedized RFID reader delivers long read range and high read rate, with a wide selection of connectivity options: 3G/GSM/GPRS, GPS, SMS, Ethernet, USB and Serial. The CS208-3G reader is extremely versatile, and can be easily deployed outdoors or indoors for mobile or stationary applications, using either remote or local networks. CSL’s new CS208-3G RFID fixed reader can be used in highway toll stations, bus stops, container ports, warehouse docks and parking lots, etc. This versatile integrated reader is uniquely offered with circular polarization antenna, enabling use in dense, long-range environments. For a demonstration, visit RFID Journal LIVE!, at CSL’s booth #738. The CS208-3G integrated reader is ideally suited to stationary check in/check out asset management applications, as well as large area continuous scanning solutions in access control, event management, and inventory management. This intelligent reader is being used in conjunction with the CS9010 Battery Assisted Passive RFID (BAP) ID card for a high-security child tracking solution. The BAP ID card, which can be read consistently and reliably when hanging from the neck or embedded in a wallet, backpack or purse, is tracked by the CS208-3G fixed reader, which then sends a wireless confirmation message to mobile devices to provide peace of mind for parents and school officials.